Overcooked is Team 17’s latest attempt to prove that as a publisher it has a lot more to offer to the world that one iteration of Worms after the last. Developed by Ghost Town Games, Overcooked is a fairly simple time management game, but it gets away with it by being bright, happy, and carries a good sense of humour with it. 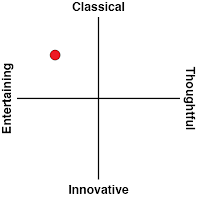 It also has a multiplayer mode that should make for a riotous party or two all by itself. In simple terms, in Overcooked, you’re tasked with taking control of a couple of chefs, and cooking up dishes as requested by customers of your little restaurant. At first, those dishes are going to be very simple; a customer will order up tomato soup, which you can cook by getting your duo of little chefs to chop up three tomatoes, and then drop them into a pot for a few seconds to cook. Then you’ll put the soup into a dish to serve and move on to the next dish. It doesn’t take long for orders to become more complex, however. For example, to make burgers, you’ll need to set the bun up on a plate, cook the meat, chop up lettuce and tomato (as requested), and then throw the ingredients all together. You need to do so quickly, because each level only runs for a certain length of time, and you’ll need to deliver a fair few orders to earn enough “cash” to pass a level, much less earn the maximum three-star rating. 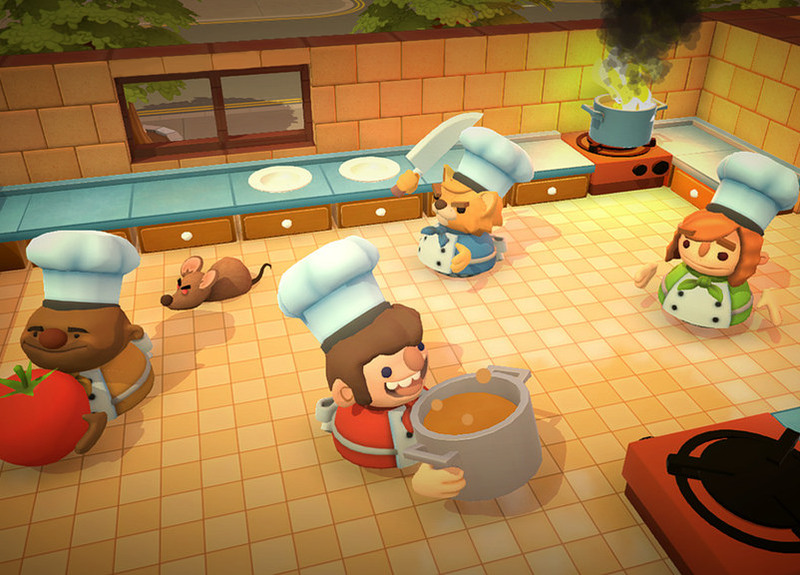 But the real skill in Overcooked comes from working efficiently, not just quickly. As I mentioned, you’ve got two chefs in the kitchen, and you’re in control of them both. The problem is that you can only control one at a time. It’s impossible to work efficiently by just controlling one, so you’ll quickly find yourself frantically swapping between chefs, tasking one to cut up vegetables while using the other to make sure that the steaks don’t overcook. One will be arranging the latest order while the other is washing up. Overcooked is a simple game, but it’s a game where seconds count, and if either chef is sitting idle for any time, it’s likely that you’ve approached the level incorrectly. You’ll also need to get yourself into rhythms, because your ability to “work ahead” is quite limited. Leave the soup or steak on for too long will cause them to burn, in other words. You’ve also got a very limited number of plates and bowls available to you, so you can’t spend a couple of seconds at the start of a level to make life easier for you by stacking rows of plates with buns on them, ready for the burgers, for example. 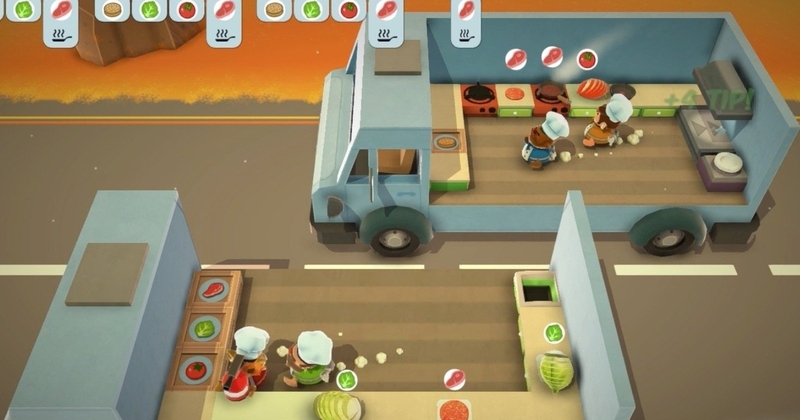 Overcooked wants to place you in a permanent state of frantic action, and it sharply curbs your resources so that you’re forced to be making things to order, constantly. Making matters even worse (or more manic, if you prefer), is that each level is laid out differently, and the design of some can be a challenge all in itself. Some of these kitchens are absolutely horribly designed – bad enough that Gordon Ramsay would track down the developers to punch them in the face if he played this game. In addition to the busywork, you’ll need to navigate your chefs around mazes of tables and other objects, and there will be times where one chef will be blocking the movement of the other. Worse, most of the kitchens in this game are in locations that should never have restaurants. One early example places you on a ship, and the tables slide back and fourth with the rocking of the waves. Another takes place in an area of weird and extreme seismic activity and will see the kitchen frequently split in two, only to rejoin later. 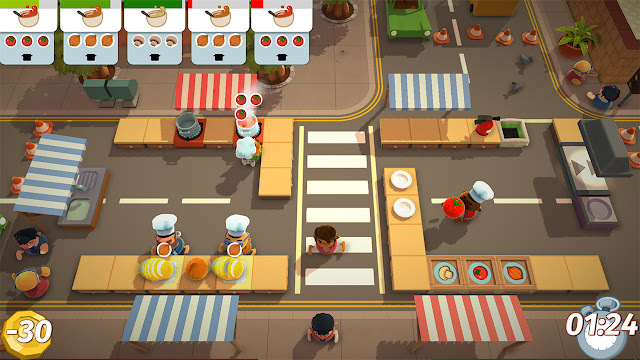 As fun as the concept is – and the bright, airy visuals and humorous characters help to emphasise this - Overcooked has a genuine ability to ratchet up the tension in its difficult time limits and tough star system. Getting three stars on a level requires an all-but perfect run, and almost inevitably means that you’ll pull up just short. Simply passing a level and getting a one star rating is relatively easy, but like with most games that adopt this mobile game approach to progression, simply passing levels never quite feels like an accomplishment. There are plenty of levels to keep you going in single player, but the real fun for Overcooked is the multiplayer… especially the competitive play. This is a game that has been designed to be as accessible as possible, to the point where it’s even possible for two players to share a controller. That the game is easy to pick up and understand within a few minutes, and it’s on a theme that is fun to just about anyone makes this a natural party game. 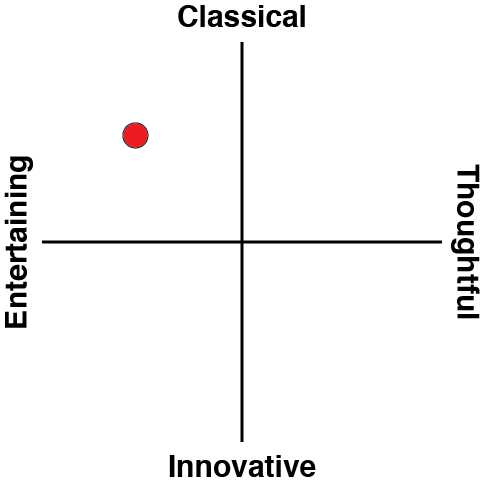 For some unfathomable reason, it actually becomes very competitive, too. Just about every time that I’ve played this game with people we’ve ended up yelling at one another and the screen, and then laughing and going for a beer run. It’s the same kind of entertainment value that drove the success of Mario Party, back when those games were entertaining board games that mixed co-operative and competitive play. Overcooked does feel like a glorified mobile game, of that there’s no doubt. Short, sharp levels, a sharp challenge in trying to get perfect scores on each level, and highly sanitized, cheerful, graphics that are as inoffensive as they are carefully constructed, all ensure that the first thing you’ll think when playing is that you might as well be playing it on iPad. But the production values, coupled with the genuinely entertaining multiplayer, help to make this one of the better “casual” games you’ll play this year.